MS Dhoni has fans from all age-group, as Mahi represents the face for India globally. The Chennai Super Kings (CSK) skipper has made his country proud by helping India win the ICC World Cup for the second time in the year 2011. Many people love him not just because of his feat but also due to his warm personality. Chennai faced Mumbai Indians (MI) in the match no 15 of VIVO Indian Premier League (IPL), 2019, where he shows nice gesture while he met an elderly old-aged woman fan. 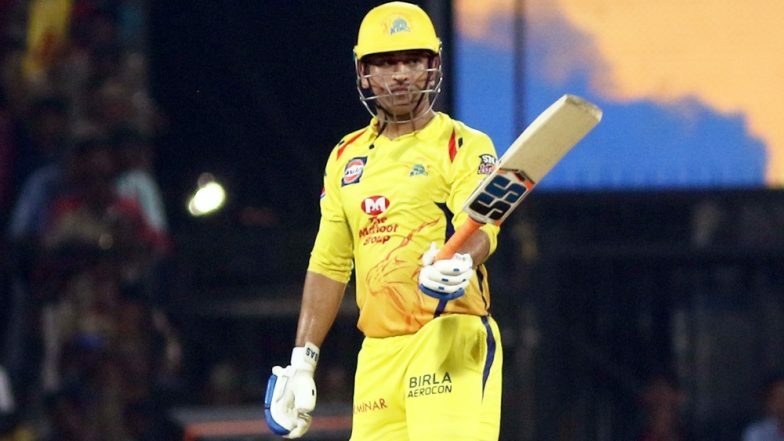 MI vs CSK Stat Highlights IPL 2019: Mumbai Indians Becomes First Team to Win 100 Matches in Indian Premier League. The old woman came with the poster on which it was written, 'I am here only for Dhoni'. Dhoni met the older age fan with an open heart, which made the senior woman extremely happy. The woman can be seen giving blessings and best wishes to Mahi. CSK lost their season first match against MI, as they were unable to chase the total of 170. Chennai inning got restricted to just 133/8 in 20 overs. Kedhar Jadhav scored 58(54) from CSK, apart from him no other CSK batsmen were able to contribute from the bat. From Mumbai Indians, Kieron Pollard and Hardik Pandya played blistering knocks to help their team reach a total of 170. Pollard scored 17 from 7 balls while the latter scored 25 from 8 deliveries. Suryakumar Yadav's half-century also helped Mumbai post a competitive total.